The Caribbean will be the sixth region of the world protected from the indiscriminate dumping of toxic waste by adopting the international agreement to prevent pollution from ships (MARPOL 73/78). From May 1 the resolution will band the pouring of oil, sewage, garbage, noxious liquid substances carried in bulk, in packages, containers, portable tanks and tank-trucks or tank-wagons into the sea. However, the International Committee for the Protection of Marine Environment called on governments and industries of the area to implement the measures established to protect special areas from pollution. 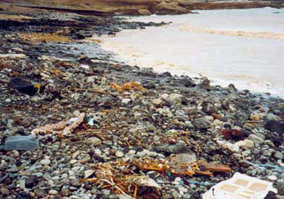 So far, North and Mediterranean Baltic Sea, the Antarctic area and the Gulf are the places where it is prohibited to dump contaminated waste. MARPOL 73/78 was adopted in the Caribbean after the main ports in several countries in the region were prepared with suitable containers for collecting waste from ships. The dumping of toxic waste is a serious threat to the health and sustenance of more than 41 million inhabitants in those territories, who depend on activities such as fishing and tourism, their main source of foreign exchange. It also threatens the existence of various ecosystems of the Caribbean Sea, the source of a wide variety of plants and endemic animals and nine percent of the world's coral reefs.